On June 28th 2009, Professor Stephen Hawking threw a party for time-travellers. Despite telling plenty of people about the date and time, sending out invitations and patiently waiting for guests to arrive, nobody showed up. The world-renowned physicist sent the invites only after the party ended, proving he said, “that time travel is not possible” as no one retrospectively attended. As much as we may want to gaze into the future; according to Professor Hawking, we simply cannot. What we can do however, is analyse what happened in the past, what is happening in the present and make projections about what the future may look like. It’s no crystal ball, but it can help us plan and prepare for what’s in store over the horizon. Projections give us a benchmark against which we can test our own opinions and expectations, serving to provoke reflection and debate. That’s what Working Futures gives us. 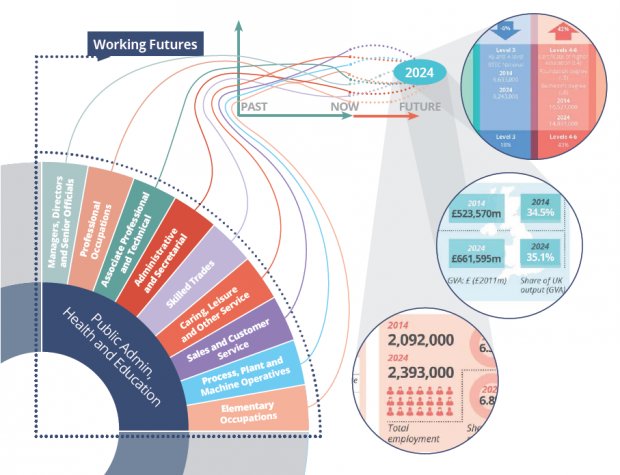 It’s a comprehensive, detailed model, projecting the future size and shape of the UK labour market. It considers employment prospects by industry, occupation, qualification level, gender and employment status. Professor Hawking once said “intelligence is the ability to adapt to change”. Adapting to change means being aware of what is changing – having the data to make informed decisions about our futures. If we don’t look to the future, we resign to reacting to developments, rather than proactively preparing for them. Working Futures’ main purpose is to inform choices by labour market players around skills, careers and employment. It is used by policy-makers, local decision-makers and employers to create strategy, identify risks and opportunities, and plan for future events. Working Futures also feeds into the LMI for All data portal, which fuels innovative applications such as icould.com. The service uses Working Futures alongside other robust, national data sources to make careers information accessible to everyone, allowing you to compare occupations and sectors, qualifications and skills required by job, and even access over 1,000 personal videos, providing inspirational careers insights. Just like ‘icould.com’, Working Futures is best used alongside other sources of information and insight, to build an unrivalled understanding of past and current trends whilst taking a peek into what the future might hold. As with all projections, Working Futures does not provide precise forecasts; rather, it gives us an indication of a likely future, given the continuation of past patterns and trends. Until we solve the time-travel paradox, we can never be certain about what will happen in the future. What we can do though, is prepare ourselves for the likely situations we may face over the horizon. That’s why Working Futures is so important – it gives us a glimpse into the future, allowing us to be more informed about the labour market and make more effective decisions. From school-leavers to CEOs, and policy-makers to college principals, labour market projections should be at the heart of your skills and employment decisions. Why not take a glimpse into your future?